Governor Gretchen Whitmer gives her State of the State address on February 12, 2019. Governor Gretchen Whitmer set some big goals in her first State of the State address Tuesday night. She’s calling for major investments in infrastructure, education, and clean water, among other things. But Republicans are skeptical about the costs of her ideas. Governor Whitmer wasted little time in her speech hitting on the subject that defined her campaign: fixing the roads. She said Michigan residents are paying for poor road conditions at the auto repair shop. “We are fixing our cars and paying a road tax that doesn’t even fix the damn roads,” she said. She didn’t offer much in the way of specifics on her plan to improve roads and other infrastructure. But she did offer some plans for another challenge near the top of her list; what she calls the “skills gap.” She’s talking about jobs employers are having a hard time finding enough skilled workers to fill. To address that, Whitmer wants 60% of Michiganders between the ages of 16 and 64 to have a post-secondary education. “It is aggressive. But it is doable. Because great expectations lead to great results,” she said. Part of that plan is a new scholarship for all high school graduates to get two years of community college debt-free. “And it will make Michigan the first Midwestern state to guarantee community college for all,” said Whitmer. Whitmer also said that there’s a funding crisis for public education in Michigan. She didn’t offer a specific plan to fix K-12 schools, but set a tone that signals she’d like to see the state spend more money on students and classrooms. She says that’s critical now, as Michigan students continue to fall behind those in other states. “This is not happening because our kids are less motivated. It’s not happening because our educators are less dedicated," she said. "It’s happening because generations of leadership have failed them." Whitmer will have to get support from Republicans in the Legislature to achieve many of these goals. She made a direct pitch to the other side of the aisle, noting that some legislative districts voted to elect her governor by double digits while selecting a Republican to represent them in the state House or Senate. “Let’s prove to the country that divided government doesn’t have to mean gridlock,” she said. But Republicans were quick to question the feasibility of Whitmer’s goals. State Senate Majority Leader Mike Shirkey said he’s not sure where the money is going to come from for all of these new programs. He’s not keen on the idea of raising taxes. “The first thing, of course, is to re-prioritize our current spending and make sure we’re squeezing every nickel out of our current spending to these high priorities,” Shirkey said. Shirkey and House Speaker Lee Chatfield also made it clear they’re not interested in one of Whitmer’s other proposals – adding LGBTQ protections to Michigan’s Elliott-Larsen Civil Rights Act. “The Senate doesn’t have any plans to take up and talk about Elliott-Larsen because we have far more higher level responsibilities and problems to solve and this one, we shouldn’t get caught up in the noise of it,” Shirkey said. Republican leaders do say they’re eager to hear more specifics about Whitmer’s proposals during her upcoming budget presentation – which will really kick off negotiations between the governor’s office and the Legislature. Updated Feb. 12, 2019, at 9:08 p.m. 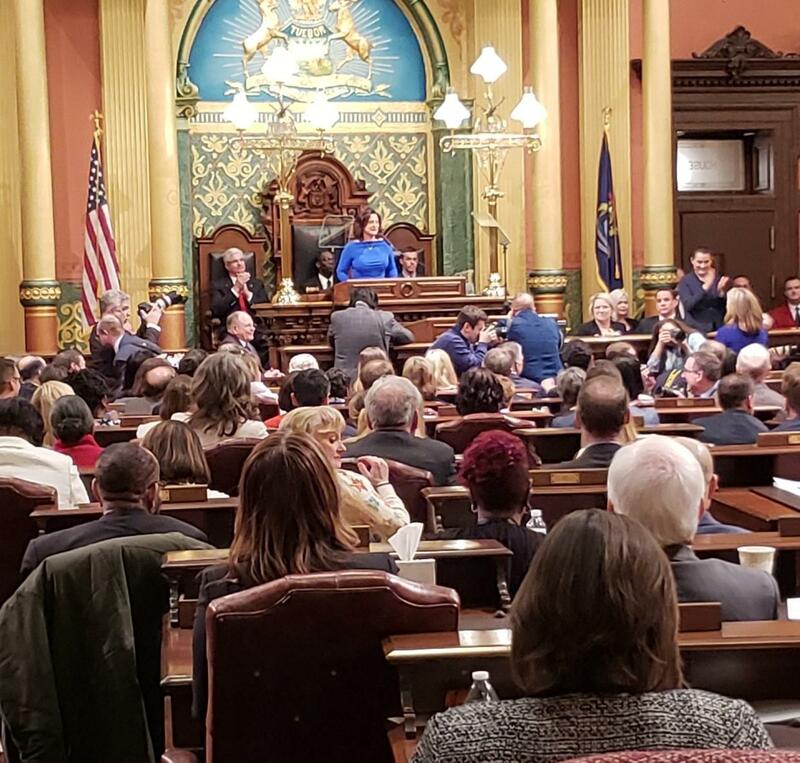 Governor Gretchen Whitmer delivered her first State of the State address, calling out two major crises she feels the state is facing: Michigan's crumbling infrastructure and failing schools. Governor Gretchen Whitmer is scheduled to give her first State of the State address Tuesday. Whitmer will be the first Democrat to give the speech in 9 years. She succeeded term limited Republican Rick Snyder. Several members of Governor Gretchen Whitmer’s cabinet are likely to get to keep their jobs. The state Senate began its Advice and Consent hearings this week for several directors appointed by Whitmer. There are more hearings to come. The committee heard from appointees to the Department of Transportation, Michigan State Police, children’s ombudsman, and state treasurer.